Samlex W h e n E a r l Be r g , f o u n d e r and president of British Columbia, Canada-based Samlex Solar, was a youngster, he watched his father use a power grinder to sharpen his logging tools from the back of his truck. "Dad was a lumberjack," says Berg. "He had this machine; I don't even know what it was called. It took hours to install and was wired into the truck. Someone had to sit behind the wheel and keep their foot on the gas to keep it running while dad was in the back. He would plug in his grinder to sharpen his saws. It was a cumbersome and compli- cated piece of machinery, but it worked." Years later, Berg, an avid outdoorsman with a passion for camping and fishing, wanted to be able to watch TV from the back of his camper trailer. From that early experience with his dad, he knew there were devices to convert DC power in vehicles to AC power. Berg didn't know what the device was called, but he began researching what was on the market. While visiting an auto shop, Berg was told that the device his dad used was obsolete and had been replaced by inverters. 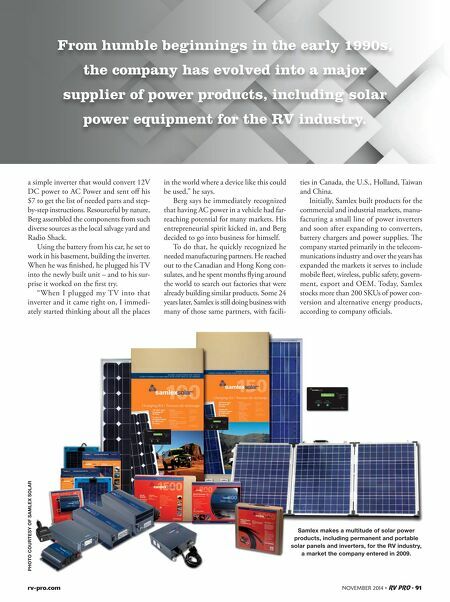 Armed with a name and a mission, Berg set out to find out everything he could about inverters and how to build them. With the Internet still in its infancy, Berg turned his attention elsewhere, pouring through books and magazines. In the back of an issue of Popular Science, he saw an ad for instructions to hand-build Owner's Inventive Nature Sparks Birth of 90 • RV PRO • NOVEMBER 2014 rv-pro.com By Terri Blazell-Wayson PHOTOS BY GORDON DUMKA/ EVOLVE DIGITAL MEDIA Samlex President Earl Berg had an idea to create a product that would let him convert DC power in his pickup to power a TV in his camper. 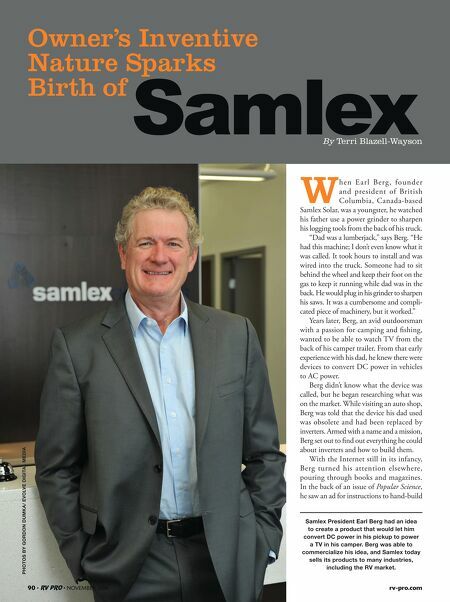 Berg was able to commercialize his idea, and Samlex today sells its products to many industries, including the RV market.